Welcome to Lea Genders fitness. I am a NASM certified personal trainer, a running coach, nutrition coach and a fitness blogger. Hang out with me in order to fast track your own running and healthy lifestyle journey. If you're a runner with fat loss goals, I'm your coach. I help runners get leaner and faster with my strength training for runners program. Runners who strength train are leaner, fitter, faster and less prone to injury. Hi. Welcome to Lea Genders fitness. I am thrilled to have you here in my little corner of the blogosphere. I am a NASM certified personal trainer, a running coach, nutrition coach and a fitness blogger. Hang out with me in order to fast track your own running and healthy lifestyle journey. If you're a runner with fat loss goals, I'm your coach. I help runners get leaner and faster with my strength training for runners program. Runners who strength train are leaner, fitter, faster and less prone to injury. I can help you. Through my teens and twenties I never considered myself athletic. I was/am clumsy and uncoordinated. I was more interested in hair, makeup and fashion than I was in sweat, ponytails and mile markers. I started running because I wanted to lose a few pounds. I never imagined it would change my whole life. After several years of running I combined my passion for running with my love of writing to start my first running blog. My blog grew over the years and has introduced me to so many amazing people and online communities. It has gone through a couple of iterations, but one thing remained consistent, my love of running. As I grew in my fitness journey I learned I needed to incorporate strength training into my workouts. Trust me when I tell you that I was not happy about this realization. I finally found an exercise that I loved and now I need to do less of what I love and do something I hate instead? I joined a runner's boot camp where I got my first taste of runner-specific strength training. The group dynamic kept me motivated. We were all runners. We could sweat it out together with our one leg squats and clamshells while discussing our latest race or PR. I fell love with the endorphins (again). I learned to love the muscle burn as much as I loved hitting the streets for a run. Even though I was enjoying the process, it was the faster paces and new PRs that hooked me. It was after I learned to balance fitness (not too much, not too little, like Goldilocks), that I started on the path to become a personal trainer. I help runners get stronger so they can run faster, stay healthy and injury free. I can help you find that balance between your love of running and the necessary runner-specific strength training. I'd love for you to learn more about my journey of years of yo-yo dieting, from being overweight to underweight, to finally finding my balance and maintaining a healthy lifestyle. I wrote a blog post about it called The Art of Balance. Hang out with me in order to fast track your own journey. Don't make the same mistakes I did that took me years to figure out. Learn how I got from where I was to where I am so you can do it so much faster. I can help you. Enough about me. Tell me about your love for running, your goals, dreams, passions and favorite band. 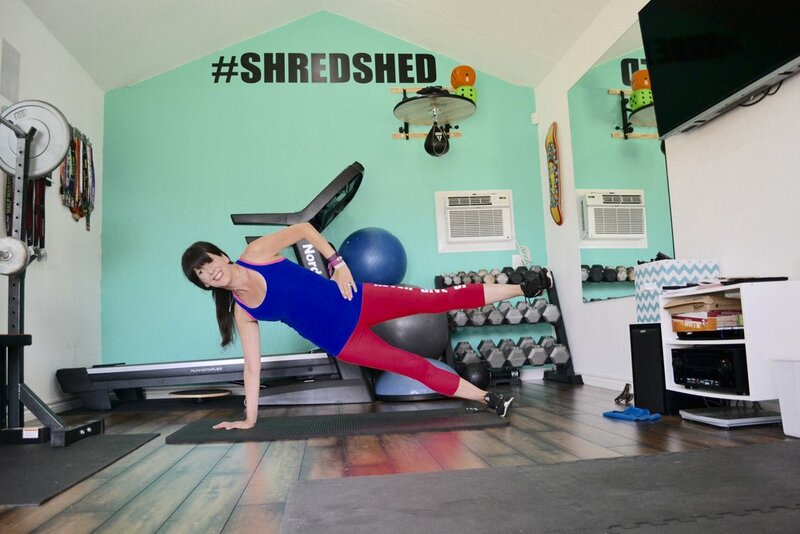 Conveniently located in Richland Hills, TX (near Fort Worth) the ShredShed is a small private studio equipped with all the necessary training modalities to strengthen our runners. Training spots available on Fridays. Please inquire about availability. Learn more about me over on my personal blog, Running with Ollie. Thank you for your interest in Lea Genders Fitness! We'll be in touch soon.